Developed and manufactured in the UK the NeoVU-4 Inspection Lamp was developed for the aerospace sector and meets or exceeds all common magnetic particle and liquid penetrant inspection requirements including RRES 90061 and ASTM E3022. Using an array of 15 high performance Nichia LED’s with optical filters the NeoVU-4 produces a wide and uniform circular beam profile with minimal visible light emissions and no hot spots. The NeoVU-4 Inspection Lamp has a huge 300mm circular beam profile for faster inspections. This is 19% larger by area compared against nearest competitor unit in our lineup measured at a distance of 380mm where intensity is >1,200 μW/cm². Data taken from other manufacturer's product data sheets. Johnson & Allen reserve the right to update this data without notice. The NeoVU-4 features integrated cooling so UV-A output stability is maintained regardless of operating period or working environment. As a requirement of RRES 90061 the unit is also fitted with temperature sensing circuity which would automatically turn off the inspection lamp if outside its standard operating temperature range. As required by RRES 90061 the NeoVU-4 also includes circuitry to limit electrical ripple below the limits defined. 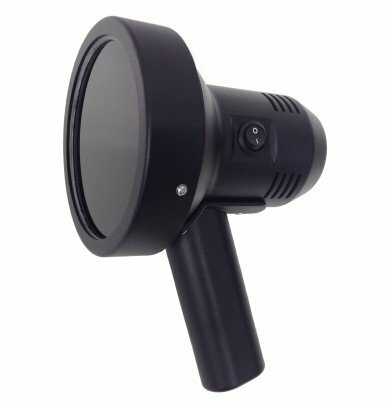 The NeoVU-4 Inspection Lamp has been designed with NDT in mind. The unit is lightweight with a comfortable to hold ergonomic handle to reduce the chance of operator arm fatigue. The handle also features a mounting hole in the base so the NeoVU-4 can be readily mounted on a work bench. The NeoVU-4 Inspection Lamp only requires a 12V DC supply to operate and is supplied with a 100V to 240V AC power supply unit as standard. The rear mounted cable in the back of the lamp is detachable and can be removed for transport or easily replaced if damaged. With low power requirements of just 33W, a long expected useful life and the unit containing no hazardous substances like Mercury, the NeoVU-4 Inspection is both safer and vastly more energy efficient than older discharge type units – Giving notable savings in the long run and being more environmentally friendly. Each NeoVU-4 Inspection Lamp is individually serialised and supplied with manufacturer’s certificate of conformity as standard. The certificate includes a peak UV-A irradiance and white light measurement and the results of all manufacturer 'type tests'. As a requirement of RRES 90061 the results for all manufacturer 'unit tests' are available to customers upon request at placement of order for an additional cost. This cost covers the work required to compile the relevant data into a report. For most customers this will not be cost effective or necessitated but Johnson & Allen can provide this information if required.